I don't have an iPhone. Or an iPad. Or an iTouch, an iPod, an iPod Shuffle, an iPod Nano or even a Mac. I do have an old iTunes account, but I rarely use it. Aside from checking my email from Dad's computer when I visit the folks once or twice a year, I really haven't used an Apple product of any sort for almost four years now. Nothing against the company or their products certainly, but it just proved more expensive to buy into their proprietary software system for the amount of money I'd have to shell out. For what I would use any of their products for, there are much cheaper alternatives that, while inferior in many design aspects, are quite sufficient for my needs. That said, I have been tempted on occasion to purchase something just so I can explore how they handle digital comics. I am, as you probably know, a big proponent of digital comics, so I would like to be as well-informed as I could be regarding them. 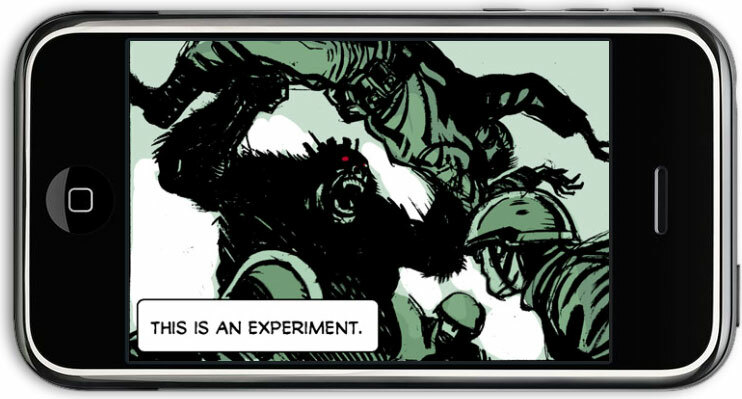 Plus, folks started released digital comics exclusively through applications unique to the iPhone/iPad. One of those comics, in fact, I was quite interested in because it was from the same creative team who brought you High Moon. 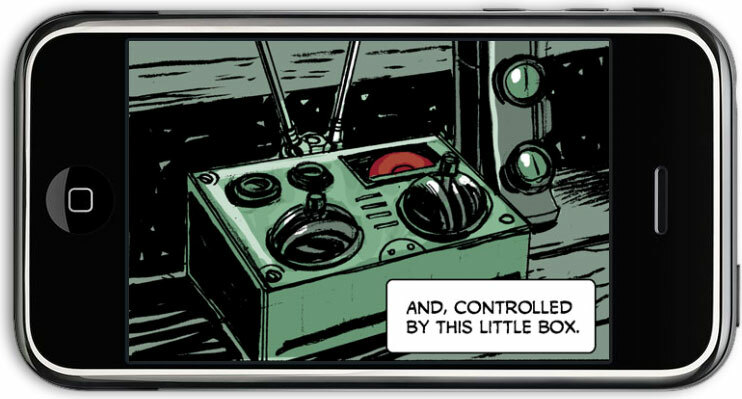 Their new comic was called Box 13, (very) loosely based off a 1940s radio show. In the David Gallaher/Steve Ellis update, protagonist Dan Holiday has written a book exposing some of the secrets behind a mysterious MKULTRA projet. Well, as you might expect, things start going downhill for Holiday as he soon finds himself at the very center of a mystery which seems to revolve around him. This MKULTRA project seems to have angered some people who lead him around the city with a series of numbered boxes. 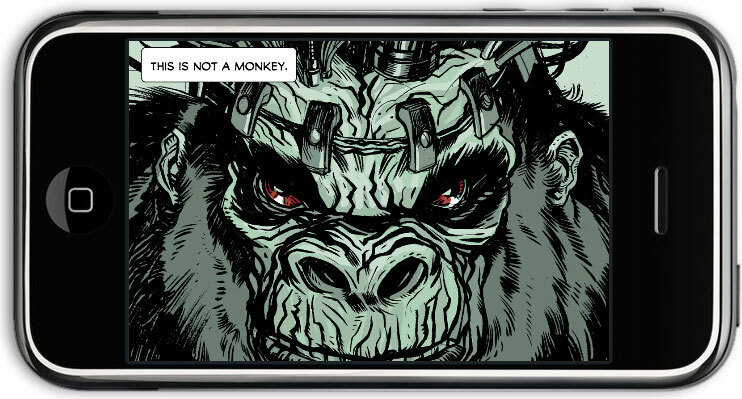 But, now that the first story has run its course on the iPhone, digital publisher comiXology has teamed up with print publisher Red 5 to produce the tale in a trade paperback form. So all of you folks who couldn't read it before now have the chance. Actually, you could have read at least some of it. ComiXology had several installments on their website available for free at one time. 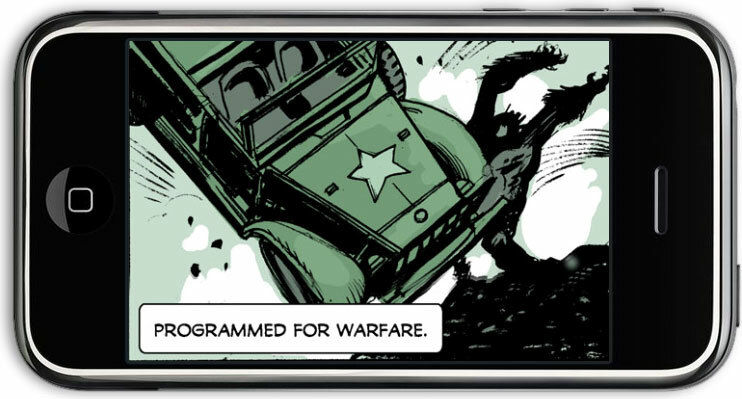 It brought up each chapter with an on-screen version of the iPhone so you could approximate what it was like to read the story as others were. All but the first chapter seem to have been taken down now, but you can get a sense of how the story unfolds on the small screen. 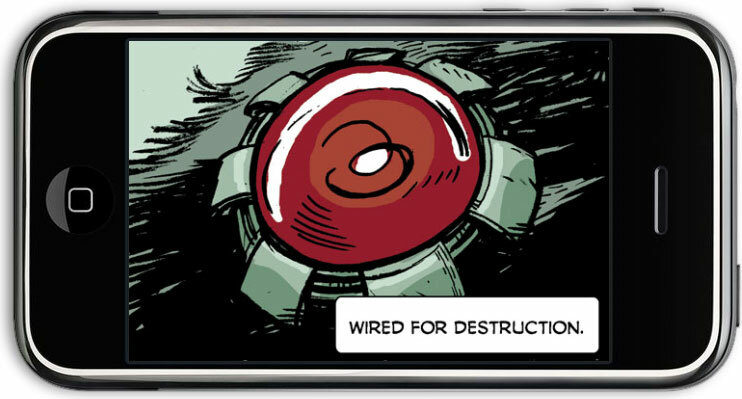 Which, if you opt to look at it, will find that it does flow fairly smoothly from one panel to the next with no apparent problems with legibility. Having seen that, though, I was distinctly curious to see how that translated to a print format. The grid structure is fairly straightforward and obvious in retrospect. But, more cleverly, it's utilized in such a way that it's not immediately apparent. Note, for example, the half splash of the monkey's face. The iPhone version is actually cropped slightly to fit the confines of the screen, but there's no appreciable amount of detail lost. The printed version, though, expands to the edges of the page, allowing for a page layout that doesn't strictly conform to the grid structure that's in place. It's quite well-executed in that regard. True, we don't get any Neal Adams-style page layouts with unusually shaped panels cutting through the entire page, but that really isn't a detriment to the storytelling here. In fact, it probably helps given the nature of the story; the grid provides a stability for the reader to balance the mysteries and confusion inherent in the plot. 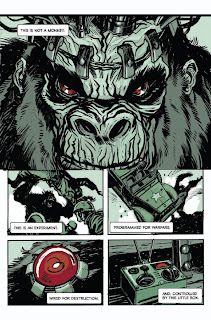 Speaking of the plot, the story has many of the hallmarks I've come to expect from the Gallaher/Ellis team. The story is a good mixture of action and adventure, and has some solid characterization. The dialogue flows very naturally, and Gallaher uses an appropriate amount of restraint in letting Ellis tell the story in pictures without feeling the need to bog it down with a bunch of unnecessary words. Like I found with High Moon, though, you do have to pay attention a bit; they use a very economical method of storytelling that puts a lot of information in nearly every panel. It's not a story you can really just zip through because you'll almost certainly miss something significant. OK, now bear with me for something of a tangent. I loved Star Wars as a kid. Best movie ever as far as I was concerned, and the first one I was willing -- even excited -- to see repeatedly. I had the action figures, the comics, t-shirts, bed sheets, the works. And then Empire came out, and I was just as excited. I went into the theater and was seeing even more cool things like AT-ATs and Yoda and Cloud City and Boba Fett and... HOLY COW! Vader is Luke's father!!! You guys remember all that? And then the movie stopped. Yeah, Luke gets a new hand and the droids are bright and shiny again and Lando & Chewie are off to save Han, but the movie just kind of... stopped. I can recognize now how Empire is often considered a better film than A New Hope but ANH still works better as a film for me because, damn it, that wasn't an ending. That was just turning off the camera because they ran out of film or something. It doesn't matter that George Lucas had Return of the Jedi already in mind at the time and knew full well that the story wasn't over -- I didn't know that. I didn't know there was more to come. I felt like there SHOULD be more to come, but it just flew off on the Millenium Falcon while I was stuck trying to peek over C-3PO's shoulder! Well, I don't want to give away the ending, obviously, but it did end up seeming like a somewhat over-complicated plot for the final payoff. But if it's not the FINAL payoff -- which I suspect it's not -- then count me in for the next installment. Provided I don't need an iPhone to view it. 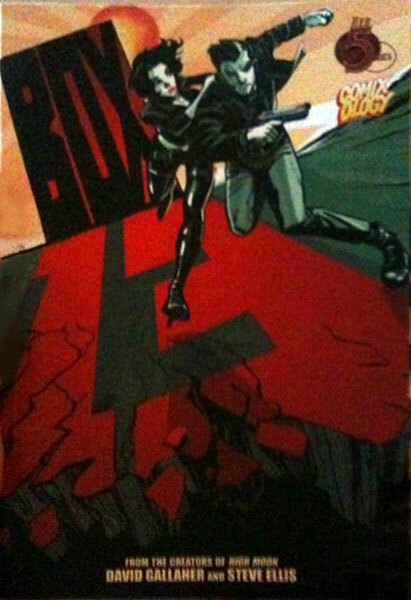 The trade paperback version of Box 13 arrives comics stores on Wednesday, June 16. I feel like I should just express, for the record, my belief that a Mac (I can't speak for the rest of the Apple lineup) isn't really too expensive these days. Or IT policies at work that reflect a laziness and/or unwillingness to provide any technical support for Macs in any capacity with the absurd claim that Macs are somehow less secure than PCs, thus forcing even designers to work on PCs with a ten-year-old operating system because the IT staff still hasn't gotten around to seeing if anything later than Windows 2000 has any security holes they need to worry about. Man, Win 2K. That is rough. I apologize for giving you a bad time, sir; clearly you have an IT department already dedicated to doing so.